Hello, everyone. Natalia is here and today I would like to tell about my love to Cover Plates. In particular to Dotted Patterns: Loops | Creative Dies. On its example I will show 4 ways of its using (of course there are much more ways of using, but for me this 4 ways are most usable). First I toned the workpiece with distress inks of mint and pink shades. 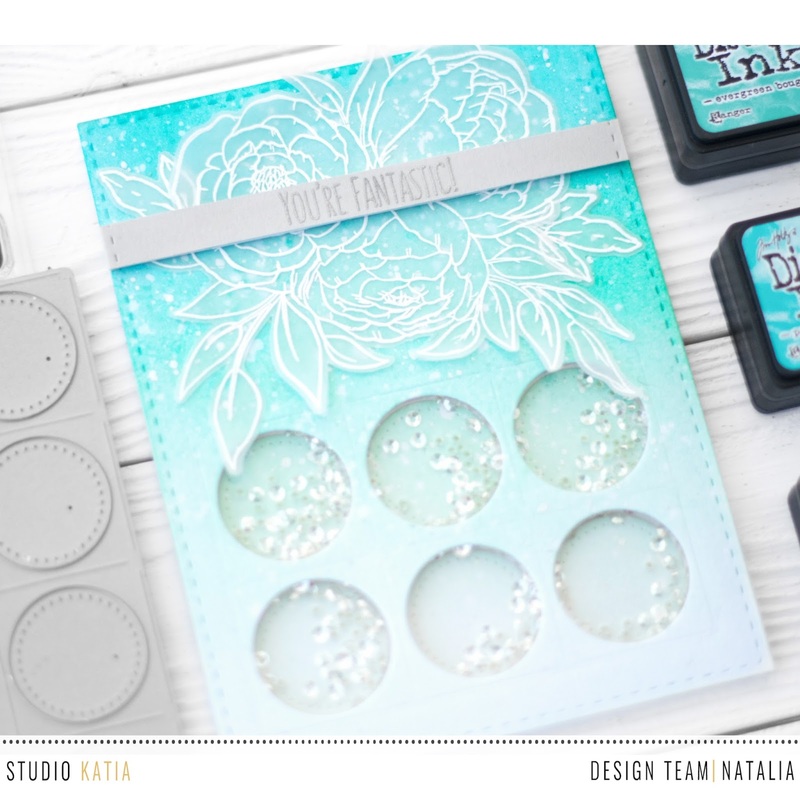 Then, using white embossing, I stamped Floral Trimmings | Clear Stamp Set. After that I cut circles with Dotted Patterns: Loops | Creative Dies. The smaller size workpiece of white cardstock has been cut with Dotted Patterns Set – 1 | Creative Dies. I glued circles, which have been cut previously, on it. Put it on the base. Stamped words “best” and “ever” from Best Ever | Clear Stamp Set on light-grey cardstock using white embossing. Stamped word “friend” from the same set on black cardstock using white embossing. Finally, put all the details together. Decorated with Clear Round Drops – Mix. Cut out windows with Dotted Patterns: Loops | Creative Dies. Made the volume frame of foam and poured Clear Rain Drops, Iridescent Clear Crystals | Mix, Sparkling Crystals | Mix, Mint Dream Crystals | Mix, Clear Iridescent – Seed Beads, Crystal Clear | Confetti, 3MM Majestic Sequins there. Stuck upper frame gethered with transparent plastic. Using washy tape I stuck cut elements on prepared shaker. I stamped sentiment from And The Fox Says | Clear Stamp Set on black cardstock using white embossing. 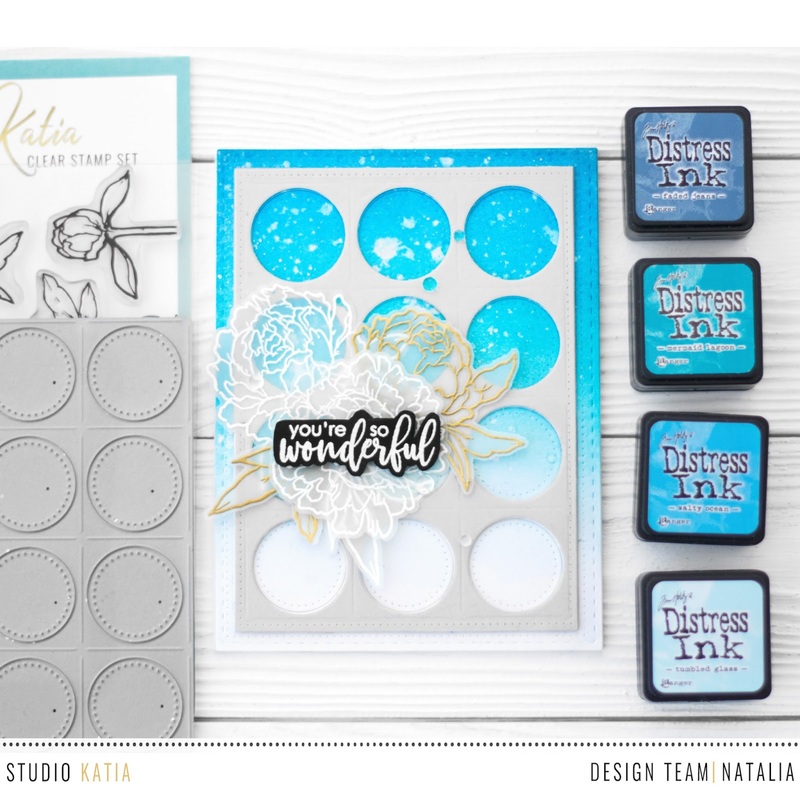 I toned the workpiece with distress inks of mint shades. Then I divided Dotted Patterns: Loops | Creative Dies on 2 parts crosswise with adhesive tape. It helped me to cut windows only in lower part of workpiece, the tape marked place where I should stopped cutting with Big Shot. Using foam I made the workpiece volumetric and poured 3MM Majestic Sequins there. Stuck upper part gethered with transparent plastic. Next I stamped bouquet from Stamptember’s “Blooming Trio” on vellum using white embossing. Cut out on a contour with scissors. On grey stripe of cardstock I stamped sentiment from And The Fox Says | Clear Stamp Set using silver embossing. Stuck everything together. Hope my experience and my favorite ways of using this die will be helpful for you.